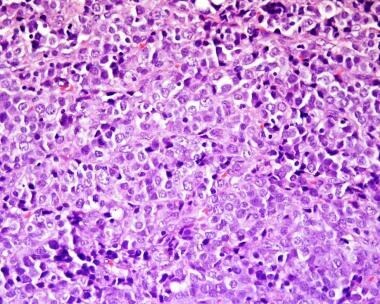 Myeloid sarcoma represents the tissue mass form of acute myeloid leukemia (AML), thus, the diagnosis is equivalent to a diagnosis of AML. Myeloid sarcoma may occur de novo, may precede or coincide with AML, or may represent a blastic transformation of a preceding myelodysplastic syndrome or chronic myeloproliferative neoplasm. Myeloid sarcoma may also be the initial manifestation of relapse in a patient with previously diagnosed AML. Myeloid sarcoma is composed of myeloid blasts, similar to AML—that is, immature granulocytic precursors, monocytic precursors, erythroid precursors, or even megakaryocytic precursors. The more frequent sites of involvement are the skin, lymph nodes, gastrointestinal tract, bone, soft tissue, and testis. [3, 4] More rarely, multiple anatomic sites are involved (< 10% of cases). Myeloid sarcoma is an extramedullary tumor mass consisting of myeloid blasts which efface the tissue architecture. The latter feature is particularly important in order to distinguish myeloid sarcoma from tissue infiltration by leukemic blasts in acute myeloid leukemia (AML) patients; AML tissue infiltrates do not form tumoral masses that efface the underlying architecture. If unstained touch imprints are available, cytochemical stains may also be helpful to delinate lineage. For example, monocytic sarcoma may be composed of a uniform population of monoblasts with nonspecific esterase (NSE) positivity (see below). Monocytic sarcoma (left to right: lysozyme stain, Wright stain of touch preparation, and nonspecific esterase stain of touch preparation). Erythroid sarcoma is relatively rare and displays sheets of primarily immature erythroid precursors (ie, pronormoblasts) (see the image below). Immunostains for e-cadherin or glycophorin may be useful to establish erythroid differentiation. Touch preparations of the tissue involved may be stained with enzyme cytochemical stains (ie, myeloperoxidase, Sudan black B, chloroacetate esterase, α-naphthyl acetate esterase, or α-naphthyl butyrate esterase). Fresh tissue suspensions may be analyzed by flow cytometric analysis, and aid in characterization. However, if the diagnosis of myeloid sarcoma is not suspected, then only formalin-fixed, paraffin-embedded tissue may be available. A battery of immunohistochemical stains is often employed, including immature markers (such as CD34, CD117) as well as markers to establish myeloid or monocytic differentiation (myeloperoxidase [MPO], CD68-R [PGM1 clone], lysozyme, CD33, CD14, CD163, etc). 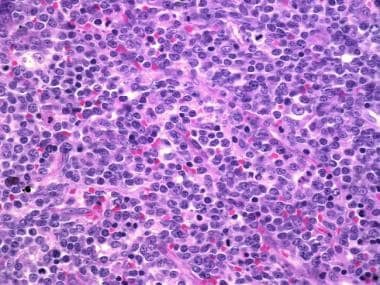 Myeloid sarcomas have immunophenotypic features that are identical to acute myeloid leukemia (AML) (see Acute Myeloid Leukemia, Not Otherwise Categorized). There are no prognostically predictive clinical or pathologic features associated with myeloid sarcoma. How is myeloid sarcoma defined? What are the morphologic features of myeloid sarcoma? What are the immunophenotypic features of myeloid sarcoma? What are the genetic features of myeloid sarcoma? What is the prognosis of myeloid sarcoma? Kashofer K, Gornicec M, Lind K, et al. Detection of prognostically relevant mutations and translocations in myeloid sarcoma by next generation sequencing. Leuk Lymphoma. 2018 Feb. 59 (2):501-4. [Medline]. [Full Text]. Kudva R, Monappa V, Solanke G, Valiathan M, Rao ACK, Geetha V. Myeloid sarcoma: a clinicopathological study with emphasis on diagnostic difficulties. J Cancer Res Ther. 2017 Oct-Dec. 13 (6):989-93. [Medline]. Tran CN, Collie AM, Flagg A, Rhee A. Testicular myeloid sarcoma: a rare manifestation of acute myeloid leukemia in an infant. Urology. 2014 Oct. 84 (4):925-7. [Medline]. Seifert RP, Bulkeley W 3rd, Zhang L, Menes M, Bui MM. A practical approach to diagnose soft tissue myeloid sarcoma preceding or coinciding with acute myeloid leukemia. Ann Diagn Pathol. 2014 Aug. 18 (4):253-60. [Medline]. Falini B, Lenze D, Hasserjian R, et al. Cytoplasmic mutated nucleophosmin (NPM) defines the molecular status of a significant fraction of myeloid sarcomas. Leukemia. 2007 Jul. 21 (7):1566-70. [Medline]. Pileri SA, Ascani S, Cox MC, et al. Myeloid sarcoma: clinico-pathologic, phenotypic and cytogenetic analysis of 92 adult patients. Leukemia. 2007 Feb. 21 (2):340-50. [Medline]. Wang HQ, Li J. Clinicopathological features of myeloid sarcoma: report of 39 cases and literature review. Pathol Res Pract. 2016 Sep. 212 (9):817-24. [Medline]. [Full Text]. Chakraborty S, Adams J, Nassiri M, Vance GH. Therapy-related myeloid neoplasm with bone marrow involvement, myelosarcoma, and a t(8;16)(p11.2;p13.3)-a case report. Cancer Genet. 2014 Oct-Dec. 207 (10-12):511-5. [Medline]. Falini B, Mecucci C, Tiacci E, et al, for the GIMEMA Acute Leukemia Working Party. Cytoplasmic nucleophosmin in acute myelogenous leukemia with a normal karyotype. N Engl J Med. 2005 Jan 20. 352 (3):254-66. [Medline]. Schwyzer R, Sherman GG, Cohn RJ, Poole JE, Willem P. Granulocytic sarcoma in children with acute myeloblastic leukemia and t(8;21). Med Pediatr Oncol. 1998 Sep. 31 (3):144-9. [Medline]. Breccia M, Mandelli F, Petti MC, et al. Clinico-pathological characteristics of myeloid sarcoma at diagnosis and during follow-up: report of 12 cases from a single institution. Leuk Res. 2004 Nov. 28 (11):1165-9. [Medline]. Goyal G, Bartley AC, Patnaik MM, Litzow MR, Al-Kali A, Go RS. Clinical features and outcomes of extramedullary myeloid sarcoma in the United States: analysis using a national data set. Blood Cancer J. 2017 Aug 25. 7 (8):e592. [Medline]. [Full Text].